“I love this guy, he’s crazy,” Mulat said. The air was dry and dusty in early May, when the hard red soil waits for rain that may or may not come by June. We were already more than 8,000 feet above sea level and still climbing toward the escarpment. A work crew crushed large stones into small ones, presumably to pave the road winding up the hillside from the city of Adigrat in the valley below. Three men shoveled the stones into a large truck, heaving in rhythmic unison to pass the time. As the path wound higher, its edges became ragged until it faded to dust at the top of the ridge. Haftay had led us, quite literally, to the end of the road. We stopped to rest while Haftay, with energy far exceeding his 50 years, continued to pose and joke and sing. I asked Mulat what Haftay — whose full name is Haftay Gidey Welihet — was singing. His timing was appropriate. We could see the town, although aside from the curve of a silver church dome — a burnished thumbnail of light in the valley behind us — it was hardly distinguishable from the ground. We’d come to an edge of Ethiopia. From Adigrat and the surrounding plateaus, the highlands drop southeast into the Danakil Depression, among the lowest points on earth. Just 22 miles north lies the long-embattled Eritrean border, and beyond that the Red Sea coast. 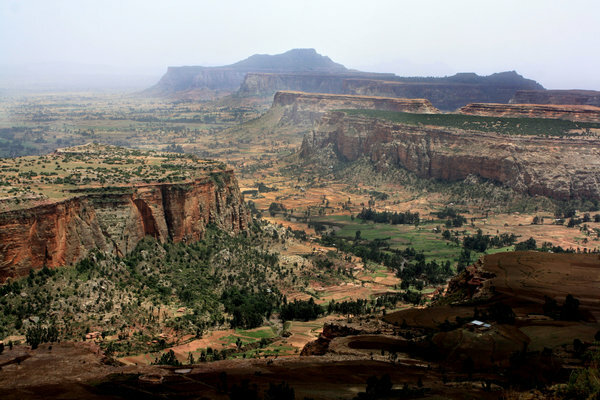 Due west is the city of Aksum, with its 1,000-year-old granite monoliths and the chapel that, according to the Ethiopian Orthodox Church, houses the ark of the covenant.